Thomas Gainsborough (1727–1788), Wooded Landscape with a Peasant Resting (1747), oil on canvas, 78.1 x 62.5 cm, Tate Britain, London. Wikimedia Commons. You probably know Gainsborough from his portraits, particularly his remarkable painting of Mr and Mrs Robert Andrews. Not only was he originally a landscape painter, but to John Constable he was the greatest landscape artist. Gainsborough’s great rival, Sir Joshua Reynolds, surpassed him in becoming the first president of the Royal Academy of Arts, in being knighted, and in writing a theoretical treatise on art, his Discourses on Art. But Gainsborough was the more successful portraitist, the more versatile (Reynolds’ landscapes were few in number and generally deemed inferior), and can rightly be claimed as a co-founder, with Richard Wilson, of the British school of landscape painting. Thomas Gainsborough (1727–1788) was born in Sudbury, Suffolk (close to where Constable was born 49 years later). Showing an early aptitude for drawing and painting, he went to London in about 1740 to study art, first under Hubert Gravelot, then in St Martin’s Lane Academy. He worked as a studio assistant to Francis Hayman, then in 1744 set up his own studio. His earliest surviving paintings date from the following year, at which time he was clearly competent in oils. In 1746, he married the illegitimate daughter of the Duke of Beaufort, who settled an annuity on the couple, providing them with financial stability. They returned to Suffolk in 1749, where he established a practice in portraiture. In 1752, he moved to the county town of Ipswich in an effort to expand his work. In 1759, he moved to Bath, where he studied van Dyck’s work and developed a much more successful studio, attracting the fashionable and wealthy. He was a founding member of the Royal Academy of Arts in London in 1768, but quarrelled with its leaders, and ceased exhibited there in 1773. Nevertheless he moved to London the following year, where he lived in Schomberg House, Pall Mall. He was commissioned to paint King George III, the King, and Queen Charlotte, and undertook further royal commissions as a result. Although it is generally agreed that Gainsborough’s landscapes – his early oil paintings in particular – were strongly influenced by Dutch landscapes, I would like to defer judgement on his depiction of trees until we have examined them, and the landscapes of Rubens in particular. Thomas Gainsborough (1727–1788), Wooded Landscape with a Man Talking to Two Seated Women (c 1745), oil on panel, 27.9 x 36.8 cm, Yale Center for British Art, New Haven, CT. Wikimedia Commons. Painted within a year or so of setting up his first studio, Wooded Landscape with a Man Talking to Two Seated Women (c 1745) is an impressive oil painting which established two themes which were to recur in many of his landscapes: rhythmic forms in tree canopies and clouds, and a particularly gnarled old tree in the foreground. His trees are carefully constructed, based on their trunk and branch anatomy, but their canopies appear fairly solid, and do not manage to give the impression of being constituted from small leaves suspended in air. A couple of years later, he painted Wooded Landscape with a Peasant Resting (1747), which I think is one of his finest landscapes. There is more subtle rhythm in the canopies and clouds, and there is no gnarled old tree in the foreground. But the foliage here does appear much more convincing and less solid. Given the relatively limited pigments available at that time, each of the trees establishes its distinctive colour, structure, and form, giving an unusual reality to this view of the flat countryside of Suffolk. 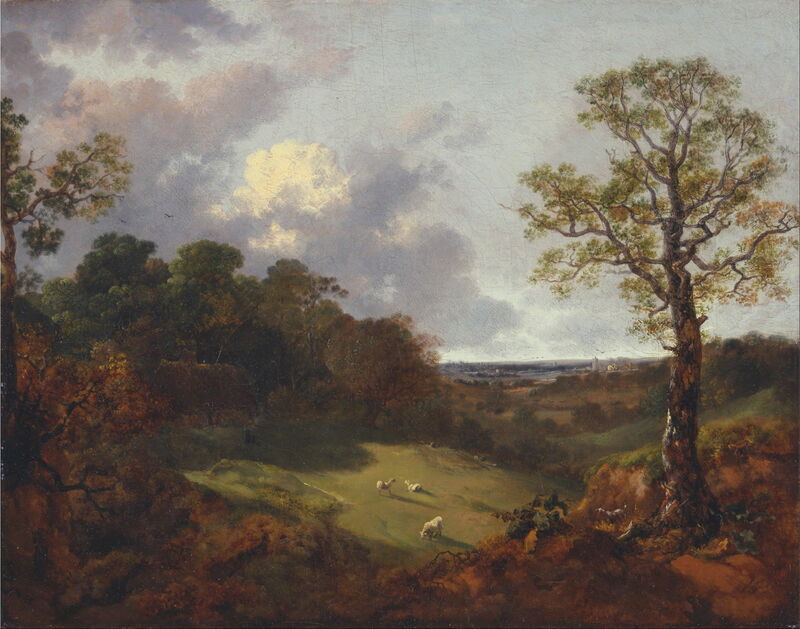 Thomas Gainsborough (1727–1788), Cornard Wood, near Sudbury, Suffolk (1748), oil on canvas, 122 x 155 cm, The National Gallery, London. WikiArt. 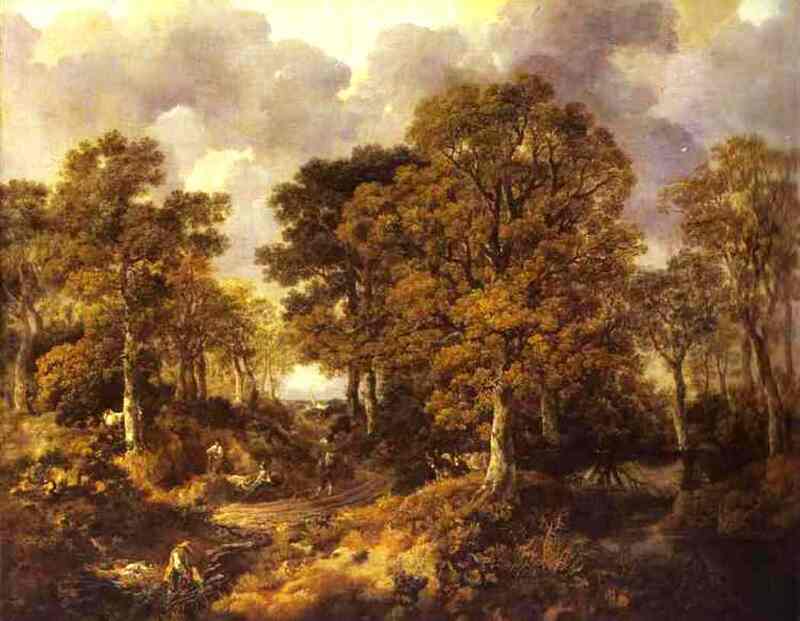 Cornard Wood, near Sudbury, Suffolk (1748) is another wonderful depiction of the countryside around his home, and one of Constable’s favourite paintings. Unfortunately the images available do not do this work justice, but it is well worth viewing in the National Gallery, London. Rhythms remain in canopies and clouds, but the gnarled old tree is still absent. 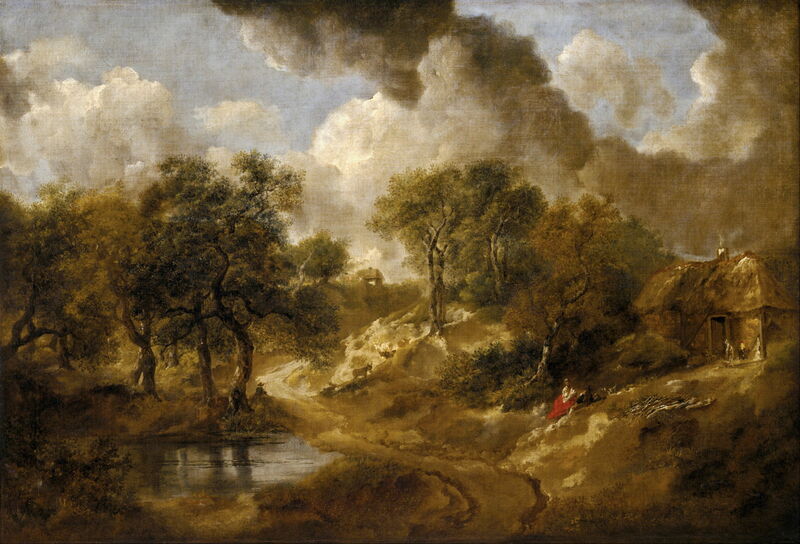 Thomas Gainsborough (1727–1788), Landscape in Suffolk, (c 1746-50), oil on canvas, 66 x 95 cm, Kunsthistorisches Museum, Vienna. Wikimedia Commons. 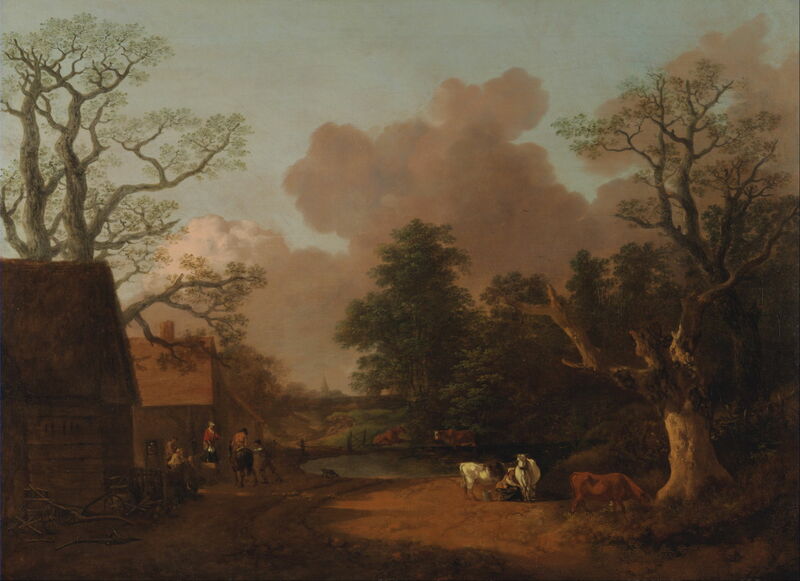 Landscape in Suffolk (c 1746-50) is not, in my opinion, as successful, the cottages and staffage becoming over-complicated and not as well composed. The rhythm in the canopies and clouds has also broken down, and it lacks trees in the foreground. 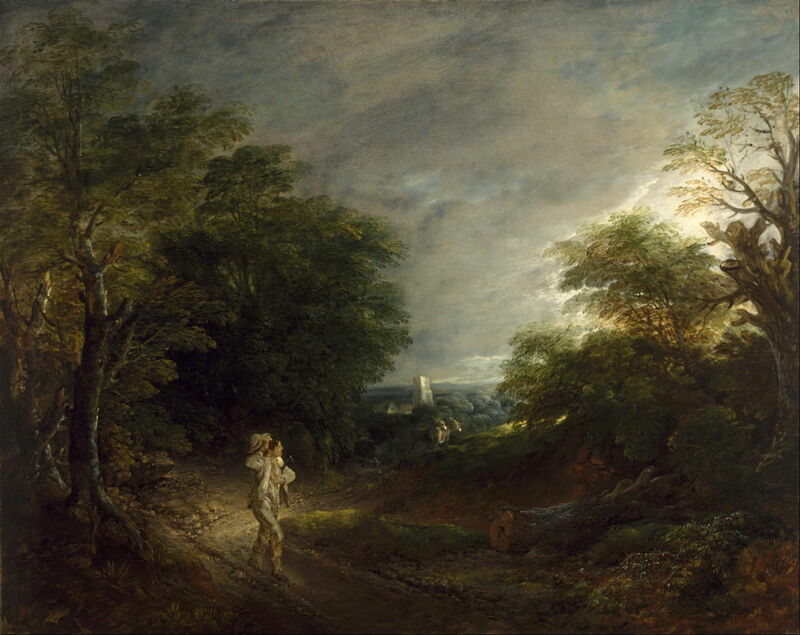 Thomas Gainsborough (1727–1788), Wooded Landscape with a Cottage and Shepherd (1748-50), oil on canvas, 43.2 x 54.3 cm, Yale Center for British Art, New Haven, CT. Wikimedia Commons. 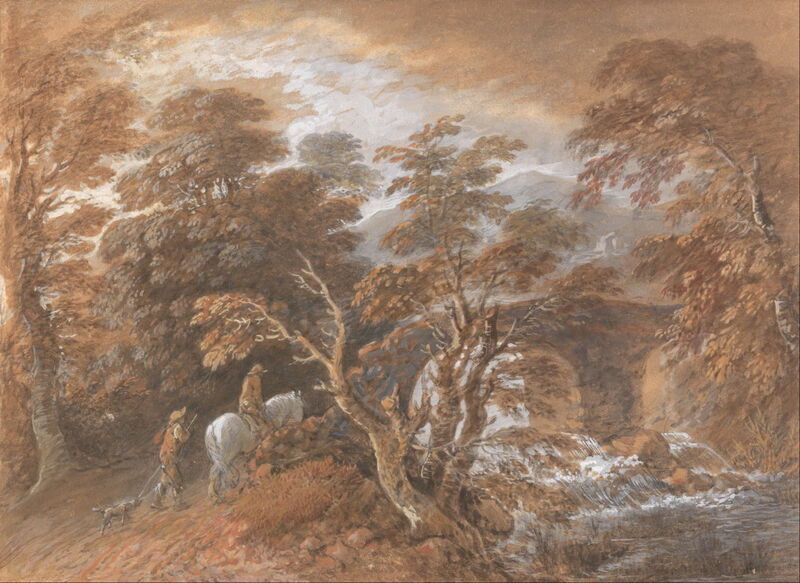 Wooded Landscape with a Cottage and Shepherd (1748-50) returns to a more classical composition, with a single dominant tree on the right, whose wonderfully gnarled and lichen-encrusted bark threatens to subsume the shepherd at its foot. Its foliage appears to have become more transparent over time, though. The rhythm in canopies and clouds is more complex, and the contrast between the canopy at the right and the form of the patch of blue sky is intriguing. Thomas Gainsborough (1727–1788), Landscape with Milkmaid (1754-6), oil on canvas, 96.5 x 124.5 cm, Yale Center for British Art, New Haven, CT. Wikimedia Commons. The last of my examples to be painted in Suffolk before he went to Bath and became portraitist to the rich and fashionable, Landscape with Milkmaid (1754-6) is a much more successful composition of trees and cottages. The rhythm in canopies and clouds is subtle, and in the right foreground is the dead hulk of an old tree, the stumps of its branches held out in similar form to the canopies and clouds. Unfortunately the paint used for the foliage of the large tree on the left appears to have become transparent too. Although Gainsborough continued to paint landscapes in oils after he had become a successful portraitist, he left many fine sketches in watercolour over that period. Set far from the flatlands of his native Suffolk, Hilly Landscape with Figures Approaching a Bridge (c 1763) is a complex composition with a lot of detail. It lacks any rhythm in the canopies and clouds, but the foreground is dominated by a group of old, twisted trunks which almost obscure the bridge. Foliage is painted more solidly than in his earlier oil paintings, and he appears to have used some gouache to paint in skylights in the large tree in the mid-left. 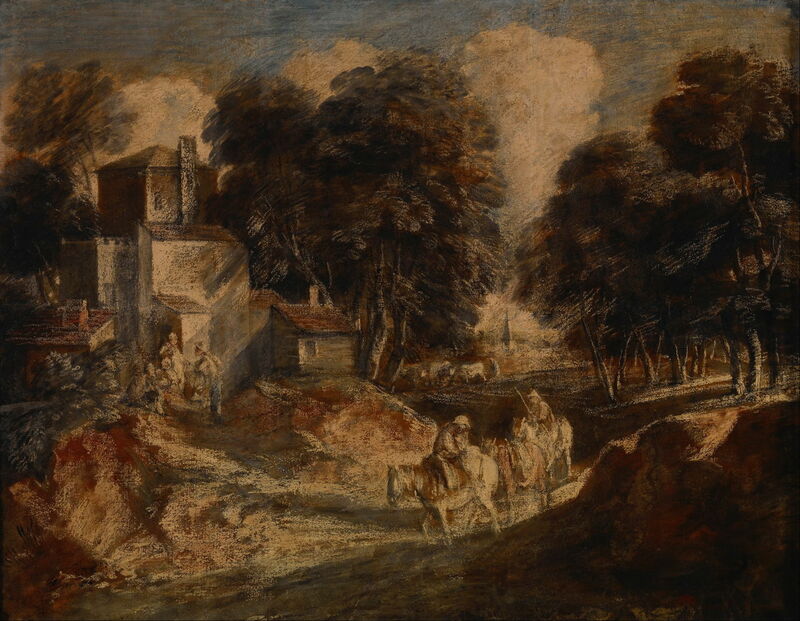 Thomas Gainsborough (1727–1788), Country Lane with Gypsies Resting (1760-5), watercolor and gouache over graphite and black chalk; verso: graphite on moderately thick, moderately textured, cream prepared wove paper, 28.6 x 23.5 cm, Yale Center for British Art, New Haven, CT. Wikimedia Commons. Probably set in the West Country’s rolling topography, Country Lane with Gypsies Resting (1760-5) is another fine watercolour, and is unusual for its lack of formed clouds. The gnarled stump of a tree has also been relegated towards the back, at the left. 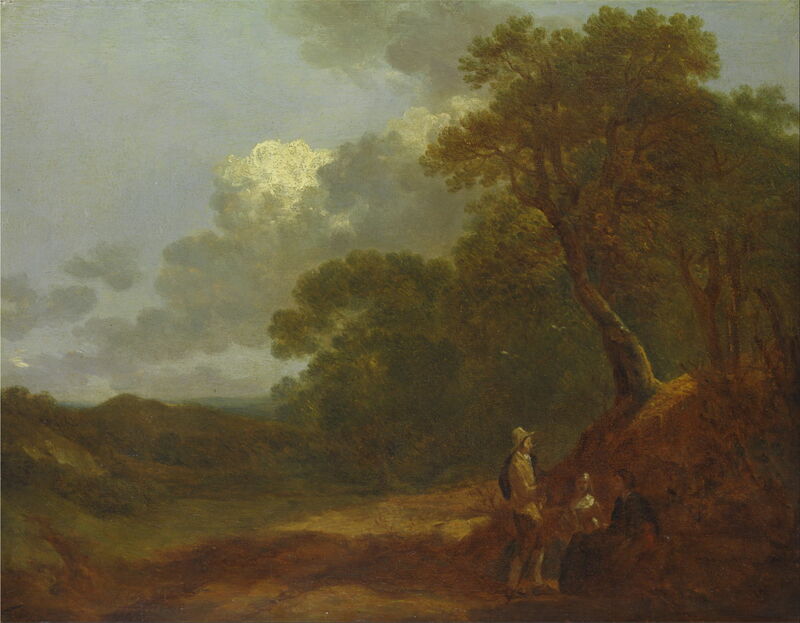 Thomas Gainsborough (1727–1788), Wooded Landscape with a Woodcutter (1757-67), oil on canvas, 126.7 x 100.3 cm, Museum of Fine Arts, Houston, TX. Wikimedia Commons. 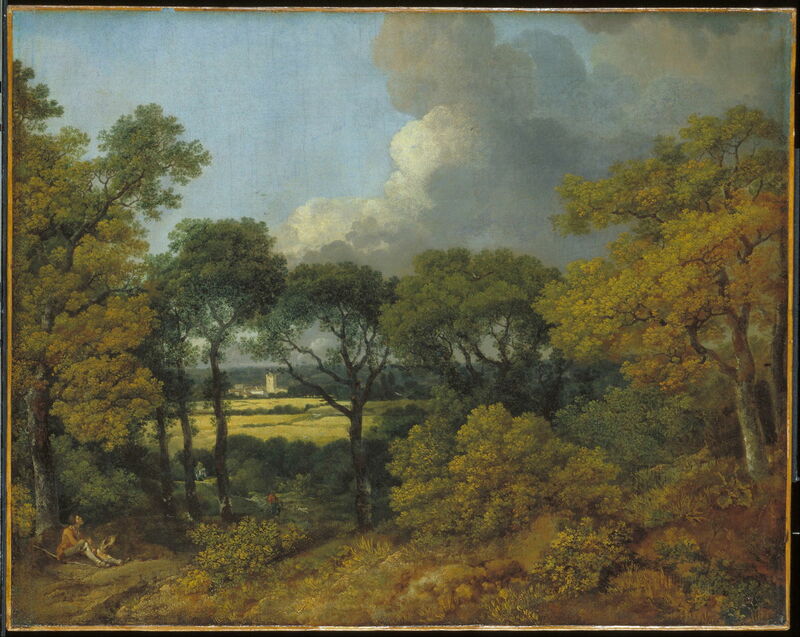 The earlier of two oil paintings from this period, Wooded Landscape with a Woodcutter (1757-67), could be set in Suffolk, and its distant highlighted church tower is reminiscent of Suffolk paintings. Although largely overcast, the canopies on the right almost cut a hole in the clouds behind, a variation on his previous canopy-cloud rhythms. In the foreground of those trees, at the right edge, is the hulk of an old tree. 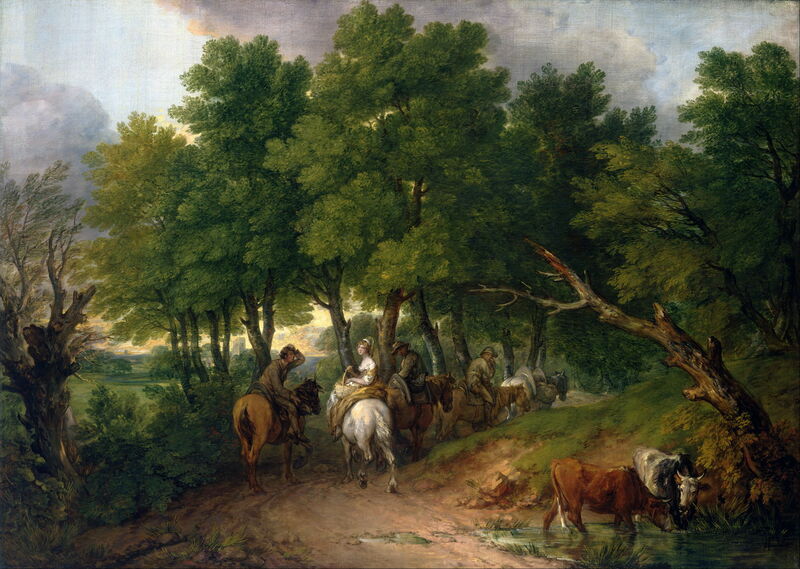 Thomas Gainsborough (1727–1788), Road from Market, (1767-8), oil on canvas, 121.3 x 170.2 cm, Toledo Museum of Art, Toledo, OH. Wikimedia Commons. The other oil painting, Road from Market (1767-8), is a variation with similar passages: dead hulks now appear at both edges, the track follows a winding course under the trees, and the church tower in the distance beckons the travellers home from market. The trees have fuller, and more solid, canopies, with no attempt made to equal his youthful success in portraying their lightness and texture. The canopies and clouds also show no common rhythm. Thomas Gainsborough (1727–1788), A Woodland Pool with Rocks and Plants (1765-1770), watercolor, 22.9 x 28.9 cm, Yale Center for British Art, New Haven, CT. Wikimedia Commons. 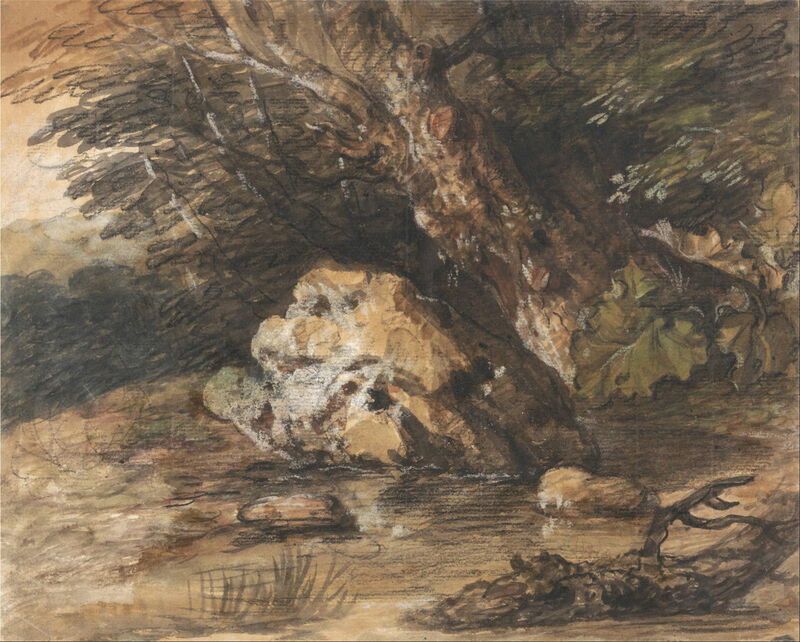 A Woodland Pool with Rocks and Plants (1765-1770) is a virtuoso watercolour study of one such gnarled relic, which may have appeared in finished form in a later oil painting. He has used opaque white (gouache) for painterly highlights which enrich the texture of the tree and rock, and foliage in the background has been loosely sketched en masse. 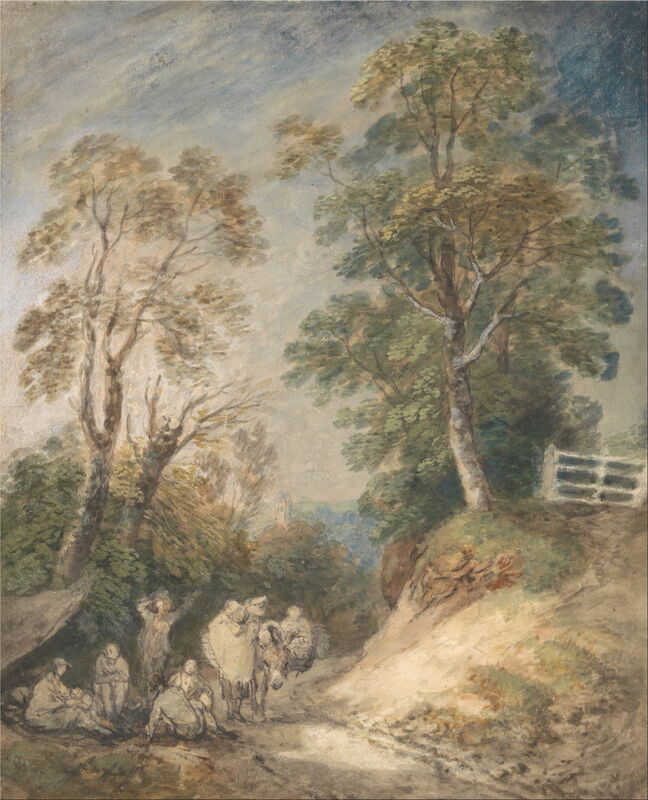 Thomas Gainsborough (1727–1788), Wooded Landscape with Mounted Peasants (1772), ink, lead white, and gouache on paper mounted on canvas, 100.3 x 127.8 cm, Indianapolis Museum of Art, Indianapolis, IN. Wikimedia Commons. Wooded Landscape with Mounted Peasants (1772) appears to have been a compositional study, executed in ink, lead white, and gouache. Its massive trees have been sketched in fairly quickly, with their canopies appear solid, but show rhythms with the clouds once more. The distant church is represented by a spire, which is less typical of his home country in Suffolk. Thomas Gainsborough (1727–1788), Landscape with Cattle (c 1773), oil on canvas, 120 x 145.4 cm, Yale Center for British Art, New Haven, CT. Wikimedia Commons. 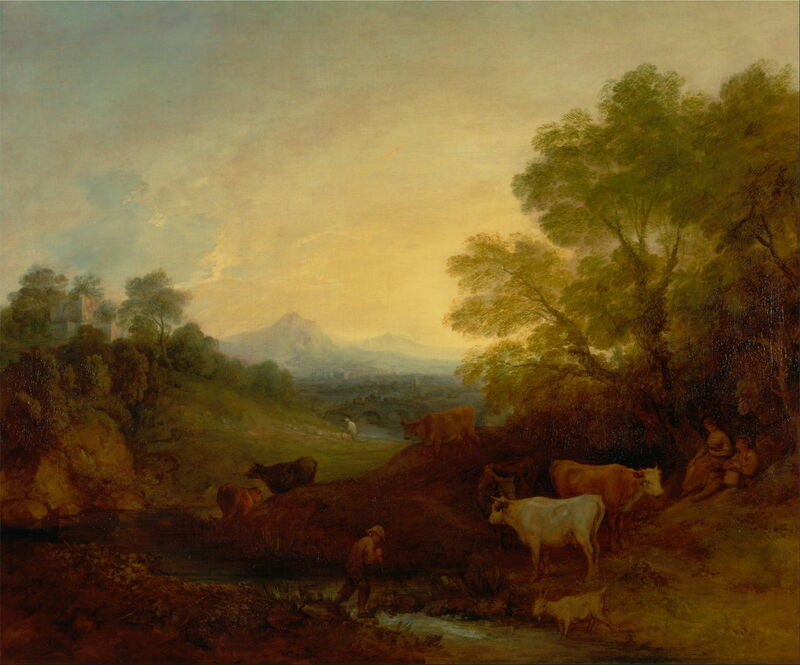 Landscape with Cattle (c 1773) shows a much more idealised, and less local, landscape, with distant mountains which are clearly neither in Suffolk nor the country around Bath. There is a gentle rhythm between the canopies on the left and a break in the clouds, and no rotting hulk in the foreground. Thomas Gainsborough (1727–1788), A Moonlit Landscape with Cattle by a Pool (c 1780), soft-ground etching, aquatint, black chalk, white chalk and gouache on medium, slightly textured, cream laid paper, 25.3 x 32.1 cm, Yale Center for British Art, New Haven, CT. Wikimedia Commons. 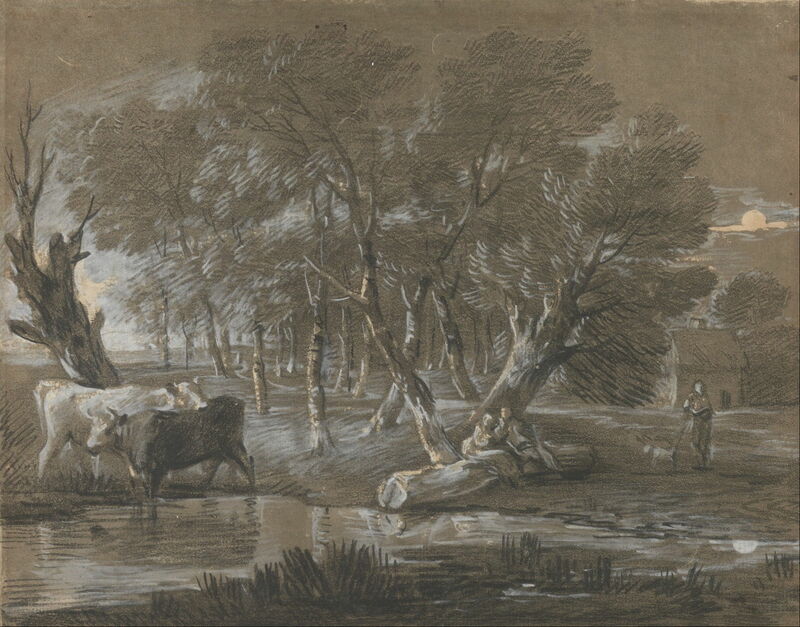 A Moonlit Landscape with Cattle by a Pool (c 1780) is a late etching with aquatint which brings together some of the features of trees seen in earlier studies, particularly the gnarled hulk at the left, and its near-mirror copy to the mid-right. Gainsborough set out to be a landscape painter, and although most of his work was portraiture, he remained a fine landscape artist throughout his career. His depictions of trees were a central part of his landscape paintings, and several of his works count among the best paintings of trees in British art. He also explored subtle rhythms between the forms of tree canopies and those of clouds, and frequently placed a gnarled old tree, usually a dead hulk, in the foreground. His shortcoming, as Constable and others observed, was a tendency, particularly in his later landscapes, to generalise, rather than to paint a single, real motif. However he was a co-founder of the British school of landscape painting, and a major influence on Constable and others. Vaughan W (2002) Gainsborough, World of Art, Thames & Hudson. ISBN 978 0 500 20358 3. Posted in General, Painting and tagged Constable, Gainsborough, landscape, painting, plein air, Reynolds, trees. Bookmark the permalink. I just wanted to say thank you for this highly informative and well-written site. There are very few like this out there, especially with such a thoughtful and thorough approach to painting and art history. I hope you continue to update because I will continue to read. Although the site does take a lot of time, it is a pleasure in many ways. There is no better way to learn yourself than to research and write about topics.